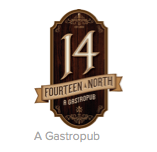 Located in historic downtown Bozeman, corner of Main and Church, 14 North offers a contemporary take on handcrafted and scratch prepared Gastro-Pub fare highlighting selections from local providers when possible. Nightly specials will feature fresh fish and a variety of additional entrees beautifully presented in a comfortable and fun, yet professional environment. Our full bar features premium specialty drinks as well as many wines to pair perfectly with your meal. 2 Happy Hours Daily 4-6pm and 9-11pm. The food is always great. They have awesome happy hour specials on appetizers & drinks too! My kids love this place and the parents enjoy a night with out them as well. Food is always good, but bring back the truffle fries. Open on Monday nights as well which has saved us one night when we could not find a restaurant open for a business dinner. Fantastic spot!! Gnocchi is my go to. Their appetizers are fantastic and the service is wonderful. It's one of the best in Bozeman! One of our favorite's in town. The food is amazing, 5 Star and the staff is always friendly and professional. The gorgeous bar and atmosphere is always a go to for us for a fun night out or date night. A lovely place!